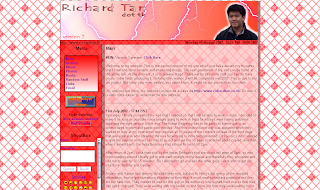 Well, thanks to my friends who hassled me to produce a web page, this was created... lol. Actually it is quite nice to have this so when I am old and nearly dying, I can come back and read up on things that I have done. What experience do you have in web designing? Below you will be able to see a picture of my first site which. The picture shows what the front page looked like. This was a very simple design and it didn't take me very long in which to create. It featured no flashy stuff and sooner or later it needed updating. The below images show my second version of my website. This had two colour schemes and it allowed you to pick which one you wanted. 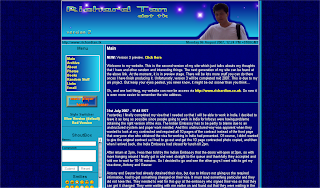 It also featured a shoutbox which at first was not created by me, but eventually was. It had things that were built on later during the life of it of example RSS and a media music player. What is this... well it is a collection of dates and times on when there have been a fire alarm in my accommodation at Stamford Street. The reason I have made this page is because I am fed up on the amount of times the fire alarm has been set off, and it will be interesting to see how many will be set off until I leave this place. What is this... well it is my collection of the results I achieved when studying at King's College London. I thought I would copy and paste here so that I will always have the results with me, and also show of to everyone, LOL. This section is just a record of the fire alarms at Stamford Street Appartments starting from the 29th January 2005. Before this date, these must have been over 30 alarms in Stamford Street and I just want to keep a record of it for fun... lol. So the below gives the date and time of the fire alarms going off. This section is a record of my results I got when studying Computer Science with Management at King's College London. The scoring grades are as follows. 70+ is an A, 60-69 is a B, 50-59 is a C, 40-49 is a D and anything under 40 is a Fail. Overall I achieved an first class with honours.